The DesignWare(R) ARC(R) IoT Development Kit is a versatile platform that includes the necessary hardware and software to accelerate software development and debugging of sensor fusion, voice recognition, and face detection designs. The ARC IoT Development Kit includes a silicon implementation of the ARC Data Fusion IP Subsystem running at 144 MHz on SMIC’s 55-nm ultra-low power process, and a rich set of peripherals commonly used in IoT designs such as USB, UART, SPI, I2C, PWM, SDIO, and ADCs. To use Zephyr RTOS applications on the IoT Development Kit board, a few additional pieces of hardware are required. A micro USB cable provides power to the board; however, if the board is to run standalone, the universal switching power adaptor (110-240V AC to 5V DC), provided in the package, can be used to power the board. (optional) A collection of Pmods, Arduino modules, or Mikro modules. See Digilent Pmod Modules or develop your custom interfaces to attach to the Pmod connector. To run Zephyr application on IoT Development Kit, you need to setup the board correctly. Connect the 5V DC power supply to your board (optional). You may need to write a prj_arc.conf file if the sample doesn’t have one. Next, you can use the menuconfig rule to configure the target. 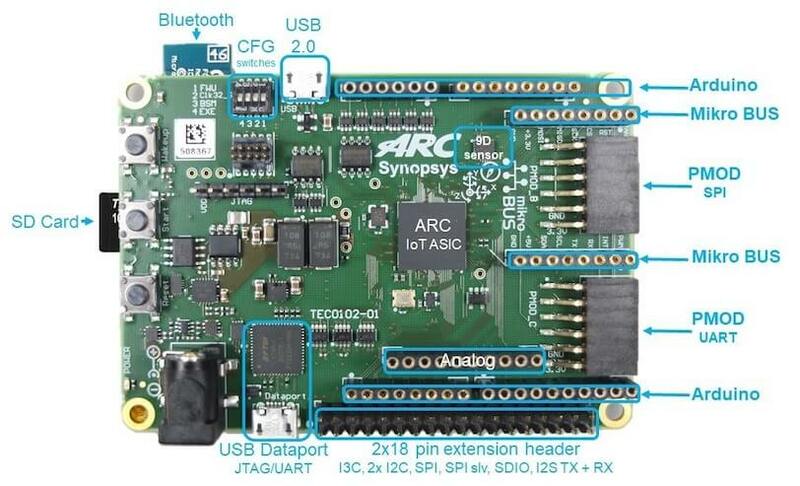 By specifying iotdk as the board configuration, you can select the ARC IoT Development Kit board support for Zephyr. You can build an application in the usual way. Refer to Build an Application for more details. Here is an example for Hello World. Using the latest version of Zephyr SDK(>=0.9), you can debug and flash IoT Development Kit directly. Then connect to the debug server at the IoT Development Kit from a second console, from the build directory containing the output zephyr.elf. If you just want to download the application to the IoT Development Kit’s CCM and run, you can do so in the usual way. This command still uses openocd and gdb to load the application elf file to IoT Development Kit, but it will load the application and immediately run. If power is removed, the application will be lost since it wasn’t written to flash. When you are ready to deploy the program so that it boots up automatically on reset or power-up, you can follow the steps to place the program on SPI-FLASH or internal eFlash. For instructions on how to write your program to FLASH, refer to the documentation on the IoT Development Kit at the embARC website.